Not only is he tough, he can also make you laugh! 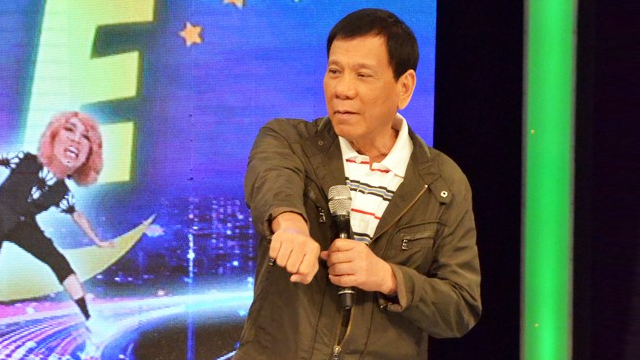 Davao City Badass/Mayor Rodrigo Duterte, known for his strict enforcement of the law and hard-hitting statements, showed his softer side during his guesting in Gandang Gabi Vice last Sunday (July 12). He talked about his personal life, cracked some jokes, sang, and even grooved to latest dance hits. In the first part of the segment, the mayor joked that he used to be gay but was reformed. He later on admitted that it was just his tactic to get closer to girls. Annulled from Elizabeth Zimmerman, Duterte also admitted that he's currently in a relationship with FOUR WOMEN. Surprised, host Vice Ganda asked if these ladies know one another. A smiling Duterte responded, "Duda ko, patay malisya lahat." In another show of jest, Duterte said he's planning to add more, this time someone, uhm, like Vice. Meanwhile, when asked what his fears are, Duterte cited three things: God, karma, and criminals. Find out why and have a good laugh!